Cover of Newsweek Magazine, November 20, 2000. Copyright Newsweek. What an exciting and fascinating time this is. No one alive has ever seen a United States presidential election like this one — a virtual dead heat, a call for recounts, a collective citizenry seemingly speaking about nothing else. Last week, I went into the country store to buy my morning Coca-Cola, and witnessed two seniors debate the legality of a new election. At work, everyone had an opinion. One was asking if we saw the Washington Post web site, another calls for the abolition of the Electoral College. Another wants a full recount. In the cafeteria, everyone is talking about it, some very passionately. Never before have I seen so many people so interested in the political process. It seems everyone has a view, everyone wants to be heard. The enthusiasm runs the full spectrum — passing interest, animated conversations, and lawmakers demanding change, heated debates, angry protesters, to those seeking lawsuits. That really isn’t fair. Both fought hard; it WAS, after all, a race. Both candidates campaigned for years and spent millions of dollars to win the race for White House. It’s not unfair or even unseemly to want to know who really won the election. My mentality — and I think many share it — is let’s get the numbers right. Let’s dismiss the fluff, the private citizen lawsuits and the legal trickery. This was an election, not a court case. Do the recounts. Be sure the overseas and absentee ballots are counted. Irregularities must be investigated and resolved properly. For the good of the country, this all must be done expeditiously. The US government is still functional and will continue to be so. There are checks and balances in place — there have been for two hundred years — to ensure that we will have a President on time. Chaos and anarchy will not result from waiting a few weeks to determine who really won the election. Meanwhile, this election has practically assured that the next election will be different. Too much happened this time, too many cracks in the process were revealed, and there will be changes. One change I see will be the introduction of on-line voting. By 2004, we will have the ability to cast a vote on line (you can already register to vote on-line today). It will as convenient and easy as on-line shopping, and will ensure even greater voter turnout. Sure, there will have to be security protocols implemented for protection against rigging and hackers, but the option of on-line voting would be a godsend for people who just don’t have time to get to the polls. Also on-line voting would create the ability to do an instant electronic recount if necessary. However, on-line voting won’t replace the paper ballot — at least for now. There will always be people who don’t have access to computers or the Internet, and people who don’t like computers. But the addition of on-line voting would have enormous benefits, as long as proper security could be implemented. Another change, which has been bandied about for years, and thanks to this election has been pushed back into the spotlight, is the elimination of the Electoral College. Back in 1787, the Constitutional Convention searched for ways to elect a president — from a vote in Congress to popular vote. It was felt that the population was either uniformed or could not be properly represented (or trusted), so the Electoral College seemed the best compromise. Two hundred thirteen years later, the concept and continued use of the Electoral College just doesn’t seem to make sense. There are hundreds of millions more citizens than in 1787, 37 additional states, and an information age undreamed of two centuries ago. People of the 21st century ARE informed, and unlike two hundred years ago when slaves, women and others were not entitled to vote, today any citizen can vote. These individual votes should count. Each one of them. An amendment to the constitution to abolish the Electoral College and make the popular vote the method by which we elect a president will require the approval of 36 states, as well as much politicking, money and time to enact. Is it worth the effort? Absolutely! Every other elected office in the land is determined by a popular vote. The office of the President should be no different. There’s another change that would benefit everyone — standardize the ballot. There would be one format for a ballot nationwide. Never mind papers here, punch cards there and butterfly booklets over there. Have one type of ballot, and advertise how to use the thing. We don’t send kids in unprepared to take SATs — why do we send people into the polling places who don’t even know what a ballot looks like or how to mark it properly? While this election will drive change, one thing will probably never change — the media making botched predictions. 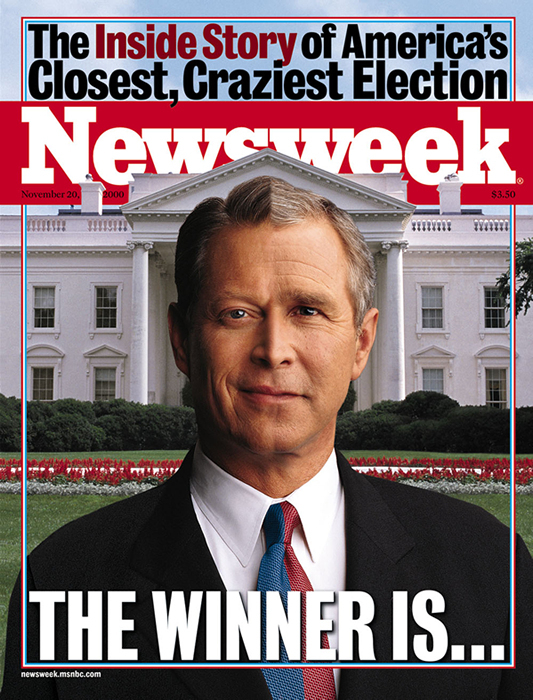 The headline of the early edition of the November 8 Boston Herald, as well as the New York Post, New York Times, Saint Louis Post-Dispatch, and many web sites proclaimed, “Bush wins!” This “Dewey Defeats Truman” headline was replaced a few hours later with one that proclaimed the race was too close to call. The media, it seems, is so anxious to be the first to break any news that they’ll go with less-than-certain predictions just to make headlines. Look at what happened with the Florida vote. Early on election night, Gore was the winner, then it was uncertain. Then Bush won, then they weren’t sure. Regardless of the number of editorials written and calls for change, networks and newspapers will continue to make predictions in future elections, and sometimes get them wrong. That’s the blessing/curse of living in instantaneous news, global society. There’s always some ambiguity, because fallible humans whose networks are pressuring them to broadcast have hurriedly compiled raw data that’s often premature or inaccurate. This is true not only about the media but also of the American people. Our need for instant gratification is getting in the way of a process that takes time. We need to be patient. In the months ahead, there will be much discussion about this across America, from newspapers and web sites and TV to local coffeehouses and schools. There will be differences of opinion and ideas will come and go. Changes to the election process may be enacted. In light of recent events, the election process will most certainly be scrutinized more carefully. The Electoral College may or may not be eliminated. But these are exciting times. People are no longer apathetic; everyone has an opinion about this vote and record numbers of people turned out to vote. People are talking about the government, the process, and their role in all of it. And finally, people have started to realize that an individual vote DOES count; that one person’s opinion DOES matter. Regardless of who you voted for and who wins the White House, this was one for the history books — not just because of the election itself, but changes for the better it will most certainly drive, as well as the way Americans demonstrated that they do care about their government, they do care about the process, and they want to make it better. How very lucky that we were here to witness it.